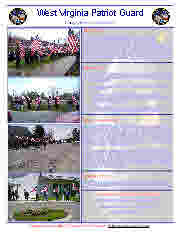 The West Virginia Patriot Guard Riders flyer is now available to download from the website. The flyer is available here to give members quick access to the flyer for distributing to potential members or other interested people. It describes the mission of the Patriot Guard Riders and gives background on why we do what we do. You may download this file and print it or take it to a printer to have copies made. Click the link or thumbnail below to download it. You must have Adobe Reader to view or print the flyer.